In June of this year, CWF’s turtle team spent many long evenings searching for turtles laying eggs. In particular we were looking for Snapping Turtles and Blanding’s Turtles in the process of laying their eggs. Our goal was to let the females lay their eggs and afterwards we would dig up and collect the eggs to incubate them back at CWF headquarters. 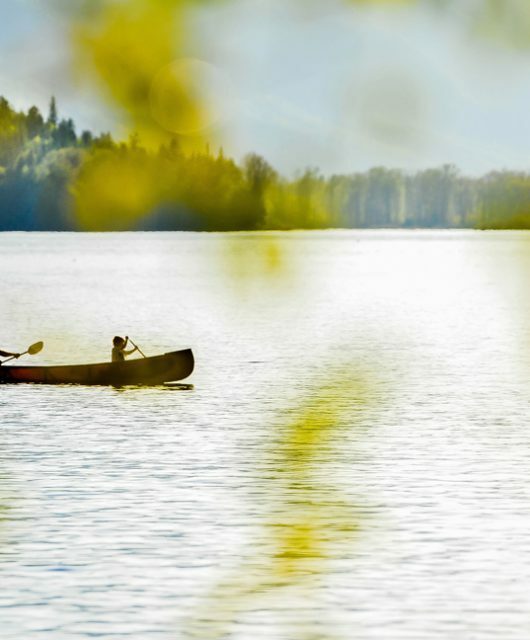 All eight of Canada’s freshwater turtles are now considered to be species at risk. 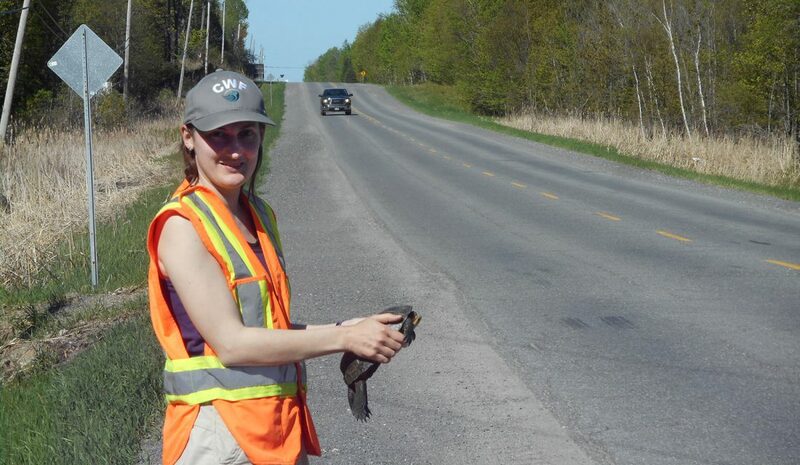 Turtles face a lot of threats such as loss of wetland habitat, and traffic mortality. In many areas 50 per cent or more of turtle nests will be destroyed and eaten by predators such as raccoons. Nest predation is a natural process, but giving turtles a helping hand by protecting their nests can benefit their populations. Excavated Snapping Turtle eggs in the field | Marquage des œufs de tortues hargneuses. Collecting turtle eggs is not as easy as it may sound. After a female turtle has laid her eggs, she packs the soil back into the hole and there is often no sign of the nest. The surest way to find a turtle nest is to find the female during the few hours she is in the process of laying her eggs. This can involve a lot of searching in the evening, when turtles are most apt to lay their eggs. Great care has to be taken not to startle the turtle, or she may abandon her search for a nesting site until another evening. Once the female has finished nesting, we carefully dig up the nest and collect the eggs. 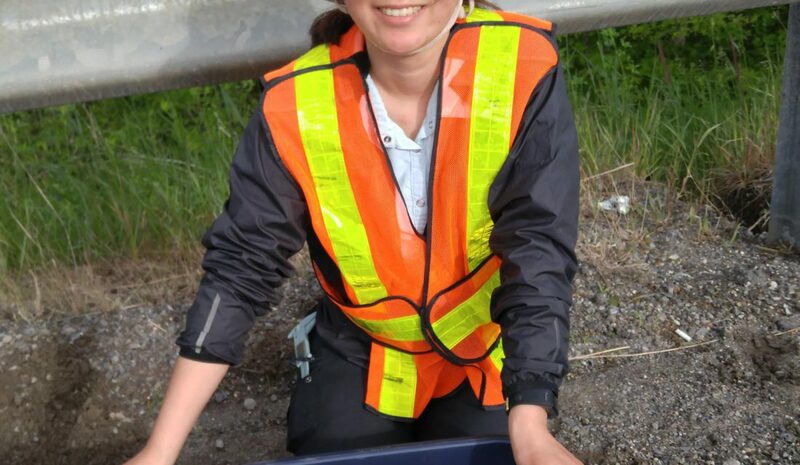 After many long and late nights, the Turtle Team gathered more than 400 eggs from roadside nests! 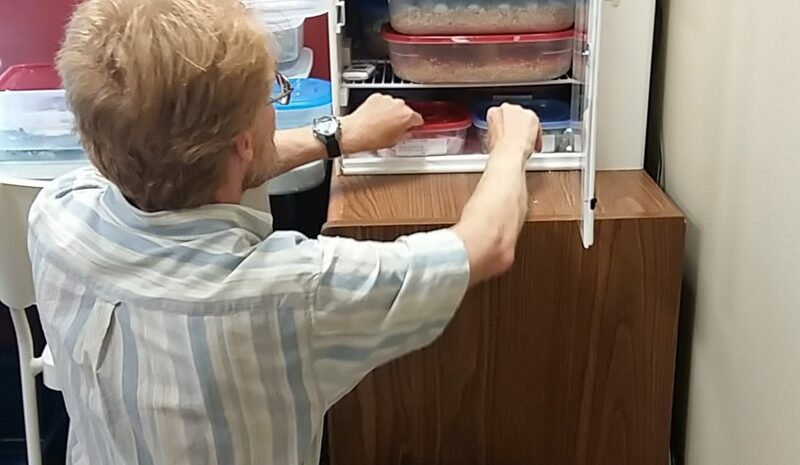 The eggs were kept in a special reptile egg incubator that maintains a constant temperature. 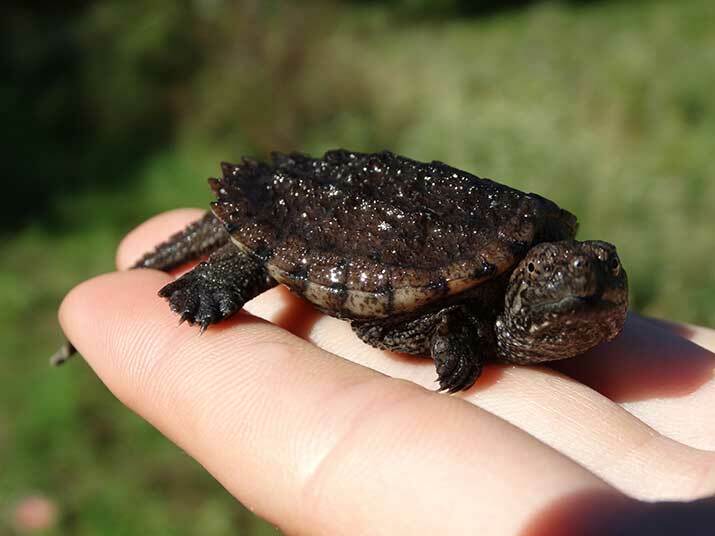 Eggs from two species at risk turtles were collected: the Blanding’s Turtle and Snapping Turtle. 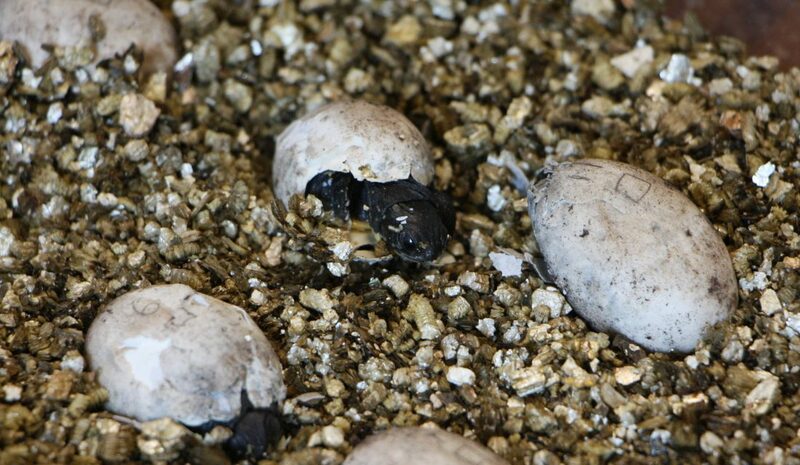 Blanding’s Turtle eggs are oval, whereas Snapping Turtle eggs are round, like tiny ping-pong balls. Blanding’s Turtles lay about a dozen eggs, whereas Snapping Turtles lay 30 to 40 eggs. The eggs from each nest were placed in a separate container filled with damp vermiculite, an artificial potting soil mixture. Our first eggs began to hatch in early August, but the eggs continued to hatch over the next few weeks. Excluding the eggs which weren’t fertilized, we had about 97 per cent of the eggs hatch successfully. Blanding’s Turtles at different stages of hatching | Tortues mouchetées à différentes phases d’éclosion | Tortues mouchetées à différentes étapes de l’éclosion. When the hatchlings first emerge, they have a yolk sac attached to their bottom shell. This contains nutrients and feeds the hatchlings for the first few days of life. We kept the hatchlings until the yolk sac was absorbed and then released each clutch of hatchlings back near where the eggs were found, at the closest wetland to each nest. By the end of August we had released almost 400 hatchlings back into the wild. These hatchlings still have a hard life in front of them. The parents do not provide any care for the hatchlings, so they are on their own to find food, avoid predators and find a safe place to hibernate for the winter. Without our help though, at least half of these eggs would have simply become food for raccoons. And possibly many of the hatchlings would not have successfully made the trek to water as the eggs are often laid 100 metres or more from a wetland. Adding more turtles to wild populations is a good start, but there are many other threats that need to be addressed to help the turtles. Learn other ways how you can HelpTheTurtles.ca. 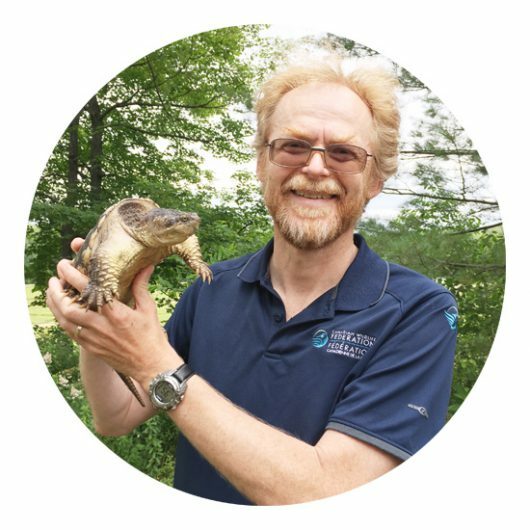 David Seburn is the Freshwater Turtle Specialist at the Canadian Wildlife Federation. David has worked on amphibian and reptile conservation for 20 years.